A largely forgotten chapter of Sikh history will soon become a permanent feature of New Delhi’s landscape. 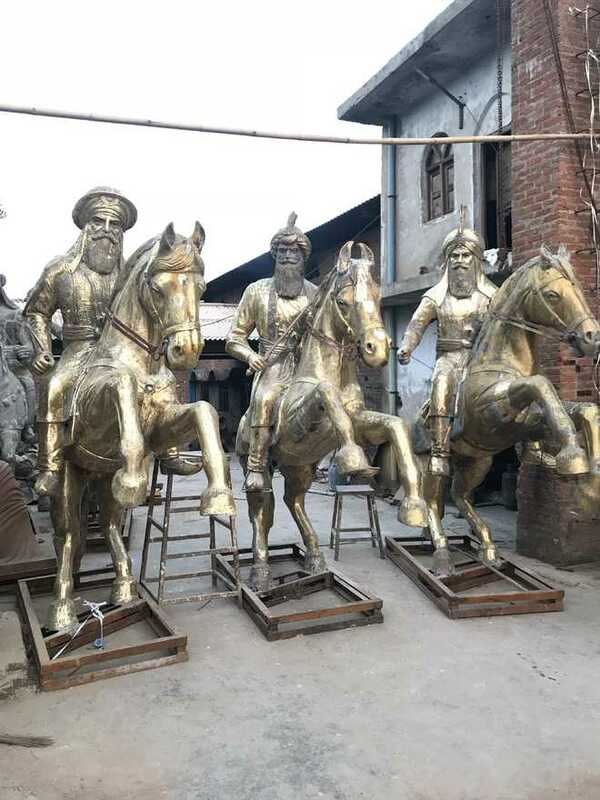 Gwalior-based Prabhat Murti Kala Kendra is giving finishing touches to the bronze statues of Baba Baghel Singh, Baba Jassa Singh Ahluwalia and Baba Jassa Singh Ramgarhia, the trio that led the Sikh forces to a triumph over Mughal emperor Shah Alam-II in March 1783. The victors had conquered Delhi and hoisted the Nishan Sahib atop the Red Fort. The statues have been ordered by the Delhi Sikh Gurdwara Management Committee (DSGMC), which has been celebrating Delhi Fateh Diwas for the past four years. Committee general secretary and Akali leader Manjinder Singh Sirsa says, “The three sculptures, each 12 ft high and weighing 1,200-1,400 kg, will be installed next month in a park opposite the Subhash Nagar Metro station and the Najafgarh Road in west Delhi. About 20 lakh commuters pass through this area daily. We hope our project (costing around Rs 60 lakh) will revive the glorious history of these ‘jarnails’, particularly the contribution of Sikhs to the country and its people.”He laments that most Dilliwallahs are unaware of their Sikh heritage. “The Tis Hazari courts are named after Baba Baghel Singh’s 30,000-strong army that camped at this site. Pul Mithai is the spot where Sikh soldiers used to distribute sweets among the public, while Mori Gate got its name after troops breached a wall to enter the Red Fort,” says the Rajouri Garden MLA. In August last year, Sirsa had written to the Prime Minister, seeking the inclusion of these warriors’ feats in the light-and-sound show at the Red Fort and the installation of their status in its grounds. The PMO replied that the case had been forwarded to the Ministry of Defence, under which the monument falls, and later referred to the Ministry of Culture. The matter is still under consideration by the Central Government. A couple of years ago, the DSGMC had unveiled a statue of Baba Banda Singh Bahadur near the Mandi House Metro station. One of India’s top sculpture makers, Prabhat Murti Kala Kendra has developed an expertise in handling Sikh subjects over the past decade. Led by master sculptor Prabhat Rai, the center has to its credit the six statues which adorn the Baba Banda Singh Bahadur Memorial at Chappar Chiri village in Mohali district.